Let’s pick up where we left off with a couple of movie reviews. We went to the opening night of Skyfall and it was really, really fun. As far as the Daniel Craig trilogy of films, this one is better than the last, but not nearly as good as Casino Royale. I loved Javier Bardem as the villain, but the plot had a lot of big holes in it (with trains crashing through them), even for a James Bond movie. This weekend Albert and I went to see Tolstoy’s Anna Karenina starring Keira Knightley. It is directed by Joe Wright, who also did Atonement, which I loved, so I was curious about this. The movie is absolutely gorgeous and completely original. He sets most of the story inside a beautiful old theater and choreographs the entire film. It’s like a painting, a ballet and a play, all rolled into a film. I loved it, and predict it will be nominated for a whole bunch of golden statues. If you enjoy period piece dramas, and Anna Karenina herself is Drama with a capitol D, see this one on the big screen, because the costumes and sets are stunning. Oh, what else is going on? Um, our new kitten broke itself. We’ve only had him a month and he’s already broken. Albert woke up on Friday morning and the cat wasn’t running around like a complete maniac, per usual. Then Albert woke me up in a complete panic, because he felt something protruding from Max’s chest, and the cat whined if he tried to pick him up. Albert suspected it was an alien. The cat was purring unless you picked him up, so we considered just not picking him up. Deciding that would make us unfit parents, I took him to the vet. 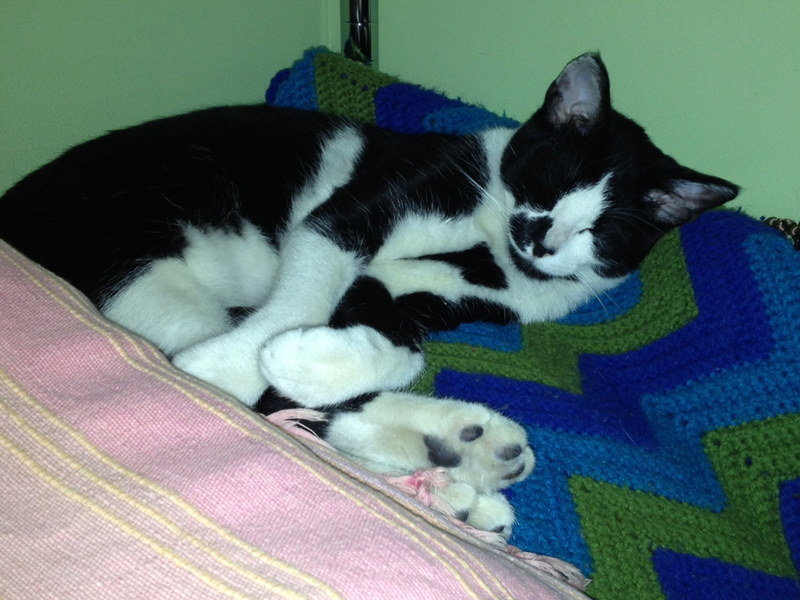 They took x-rays and found that somehow the cat managed to dislocate his sternum. The bottom piece of it was bending out instead of in, because the kitten leaps around like a drunken gazelle and must have rammed itself into furniture or a wall. We were supposed to spend the weekend in Palm Springs, instead of feeding Max droppers of pain medication, which the vet informed me has street value. My friends get drunk in the desert, my kitten gets high, and I get to watch a film from late 1800’s Russian literature. What’s happening? Damn cat. I have one other thing to tell you about, and that would be one perfect night at the Hollywood Bowl. Ladies and gentlemen, Barbra Streisand. Last Sunday, Albert and I went to the final night of her tour, and it was completely awesome. She sounded great, looked like butta’, and actually seemed to be having a really good time. Obama had just won the election on Tuesday night, and hearing Barbra sing “Happy Days Are Here Again” was icing on the cake. 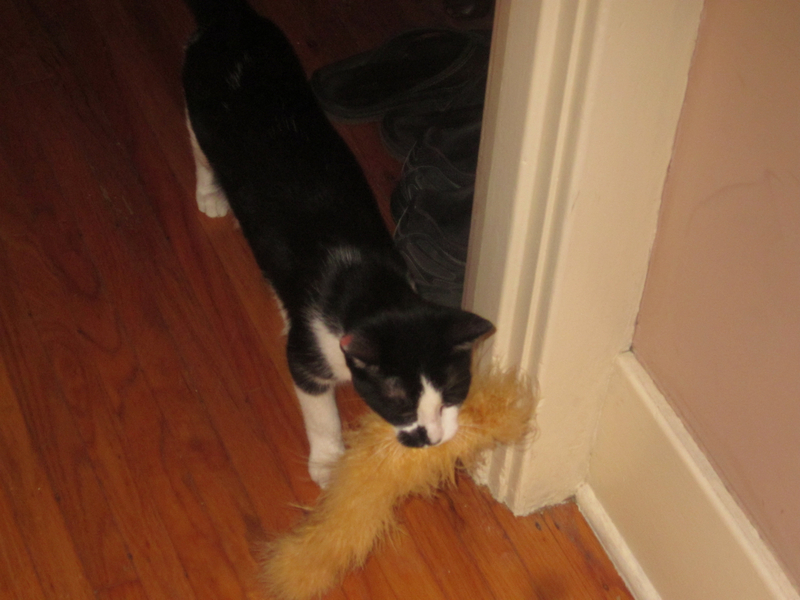 Our new kitten Max has fondly taken to marabou. He’s often dragging around large pieces of feather boas that he finds in the costume closet, so we’re also calling him Maxine. We love our new drag kitty! I’ve had a week of movies and have some quick reviews for you. Our house is very close to Paramount Studios, where they are doing some big redevelopment project. To keep the neighbors happy during the construction, which I have not been bothered by at all, they invited us to a screening of Flight at their theater on the lot. I of course considered dressing as Norma Desmond, because I cannot drive through that gate without thinking of Sunset Boulevard, but I decided against a mid-week costume. Flight is pretty darn good, not great, but worth seeing. Denzel Washington, and the acting across the board for that matter, is excellent. The plane crash sequences at the beginning are fantastic but the movie is a bit disjointed. It starts as an action movie but turns into a fairly predictable film about AA, which oddly glamorizes drugs. We also went to two movies as part of the AFI film festival. The first was the world premier of Hitchcock at The Chinese, starring Sir Anthony Hopkins as the famous director during the making of Psycho. He is great, and both he and his makeup people are sure to be up for Oscars this year. He should be joined in awards season by Helen Mirren for her fiery performance as his wife in the film, which is essentially a love story. I loved the entire movie—the screenplay, the sets, the costumes, and predict that it will be nominated for Best Picture. The second movie was also great, and is sure to be another Oscar contender. We went to The Egyptian and saw Silver Linings Playbook, an incredibly funny movie about bipolar disorder. It’s like a RomCom with rage and rumba dancing, and I loved it. It stars the handsome Bradley Cooper, who actually introduced the film, in his best performance to date. He plays opposite the equally talented Jennifer Lawrence from Winter’s Bone and Hunger Games. I always expect her to fight everybody to the death now. This weekend we’re headed to Bond, James Bond, so more on that later. My star sighting for the week was Jeff Daniels at Trader Joe’s yesterday. Also, apparently my house aired on Dexter this week, so fans of the show should look for it. We get broken into! So, our President is still running the country, so hopefully we won’t have to hear from non-inclusive Romney anymore. When will people learn that the parties worth going to are the ones where everyone is invited, and there’s no velvet rope with VIPs? No matter whom you wanted to win, the important thing is that it is over! Speaking of ridiculous Mormons, Albert and I finally got to see The Book of Mormon at The Pantages, and the show is as funny as you’ve heard. It is also so hysterically dirty that I’m very curious how the tour will play across our God-fearing country. In addition to it’s witty South Park sense of humor, the musical is also very sweet and smart. Unfortunately, there was an idiot sitting behind me laughing so crazy hard, and at odd places I might add, that I missed most of Act 1. Not only that, but everyone kept looking at me as if I was the one with the braying, maniacal laugh, as opposed to the annoyed guy who waited forever for a good seat, only to have the show nearly ruined by said man. Hello! Also, Halloween happened, and what a trick of a treat that was. 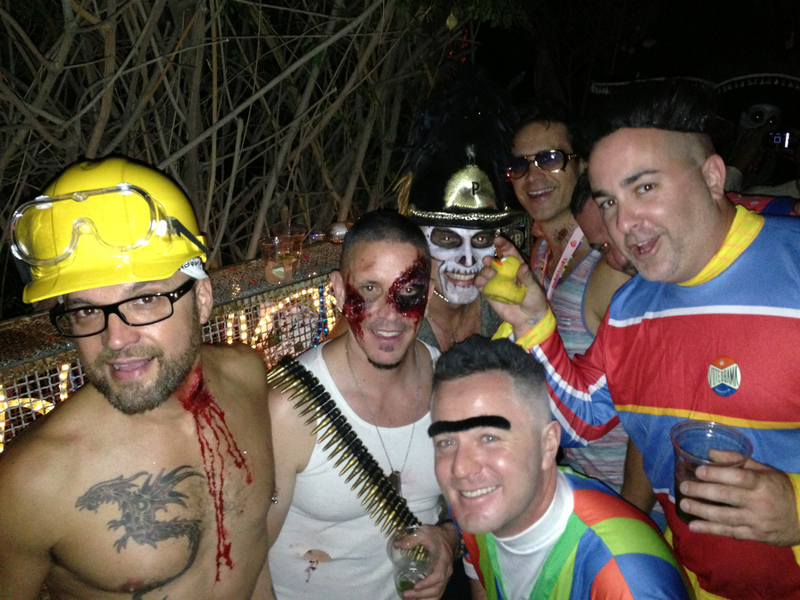 We danced at Halloweenie, a benefit on the set of True Blood, and partied at Don and Taylor’s bash in Silver Lake. 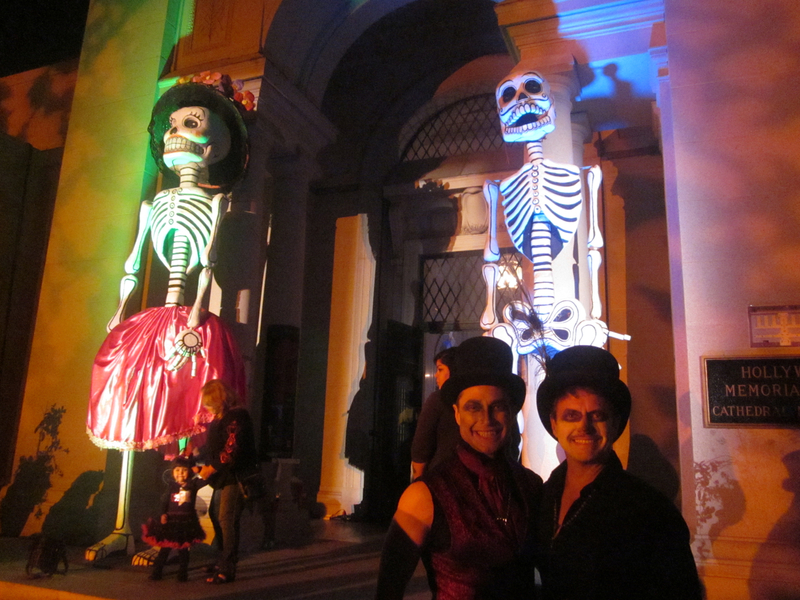 The holiday wouldn’t be complete without a trip to the Hollywood Forever cemetery for their Day of the Dead celebration, which was beautiful.